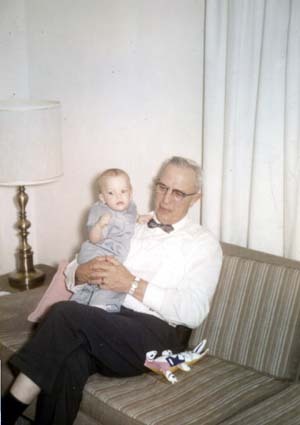 Grandpa Carl and me - April, 1962. I'm sure neither one of us knew that we would both go on the air as W8FGU. My Grandfather, Carl Worrick (the original W8FGU), got me interested in Ham radio when I was youngster in the late 60's and early 70's. I did some research and found out that he got his ticket sometime in the fall of 1932. He would sit me down in his shack and teach me basic electronics and explain how all "those things" in his shack worked. We built crystal radios and code oscillators. Our intent was to get my Novice ticket when I became a teenager. Unfortunately, he passed away before I could get my ticket. My interests changed in my teens to cars, girls and rock-n-roll, but it did inspire me to go to school for electronics and led to a 17 year career in the computer IT business. I made a huge career change in 2000 and noticed a technical void in my life and began researching Ham radio once again. My primary focus was to get on HF and operate CW. So, I began studying for my ticket and started building my Elecraft K2/100 transceiver. I tested and passed the Morse code, Tech and General elements in March, 2006 and then went back and got my Extra in May. I then applied for the vanity call W8FGU that much to my surprise was still available. I continued building my rig and putting the shack together over the spring and summer. I finally got on the air on September, 2nd 2006 as W8FGU and made my first CW contact on 40m with Rick, K4UFS who was gracious enough to put up with my brand new fist and get my first entry into the log book. I am very proud to have my Grandfather's call back on the air. I like operating mostly CW on 40 meters. I also like operating portable in my yard or trips down south to northwest Alabama. I've been having a blast operating CW and learning the ropes. Everyone I've met on the air has been great and very encouraging. I continue to add other kits to my shack and have found the building and testing process very rewarding. It is a great educational process that gets me intimately familiar with my equipment allowing me to modify and service them when required. My shack is in a room in the basement along side some of my other hobbies. My wife has allowed the occupation of the basement and garage for my stuff, while she gets the rest of the house. It seems to work well for the both of us (and our dog). I'm a firefighter/paramedic and a Lieutenant by trade for a medium sized fire department in a southern suburb of Detroit. My wife is a Director for Children's Hospital of Michigan in Detroit. (You can just imagine the dinner conversation). Our careers keep us pretty busy and don't always leave me a lot of time to operate as much as I would like. Not to mention that the enclosure business has been, much to my surprise, very active and has allowed me to finance a good chunk of this wonderful hobby.